Welcome to Anand Industries. 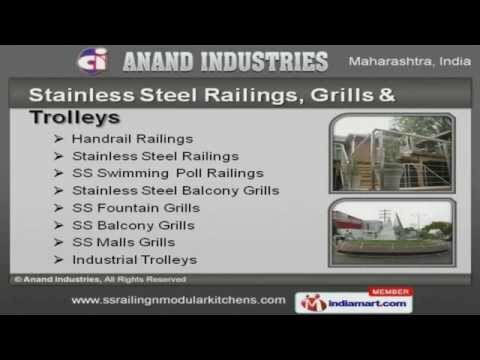 Provide Stainless Steel Products and Allied Services. The company was incorporated in the year 2005 at Pune. Efficient logistics support and Robust infrastructure facilities make us different from others. We are backed by customized solutions and Advance technical support. Whirlpool and Excide Batteries are some of our prestigious clients. We offer a vast range of Stainless Steel Glass Railings and Kitchen Drawers. Our Stainless Steel Railings, Grills and Trolleys are very stylish and elegant. Stainless Steel Glass Railings and Kitchen Drawers offered by us that are a class apart. Our Stainless Steel Kitchen Accessories and Kitchen Baskets are cost effective. We also provide Modular Kitchen and Medium Density Fiberboard Shutters that are best in the industry. Along with that we offer Name Plates Accessories and Post Forming Services that are extremely reliable.